PDQ Inventory stores its database locally (on the PDQ Inventory console computer) in %ProgramData%\Admin Arsenal\PDQ Inventory. NOTE: %ProgramData%, was introduced in Windows Vista and used in subsequent Operating Systems (Windows 7, 8.x, 10, etc), and is a folder designed to hold application-specific (that is, not user-specific) data. By default, Windows marks this folder as hidden. Its default location is %SYSTEMDRIVE%\ProgramData. If you are running PDQ Inventory on Windows XP or 2003 (no longer supported), the default location is %SYSTEMDRIVE%\Documents and Settings\All Users\Application Data. If your console performance is lagging during scans, you may consider moving the PDQ Inventory database to a faster disk. For information on this procedure, visit the PDQ.com Support page at https://support.pdq.com/home and click Submit a Request or email your request directly to support@pdq.com, or click Help > Submit Feedback. You can also browse the PDQ.com forums for FAQs. 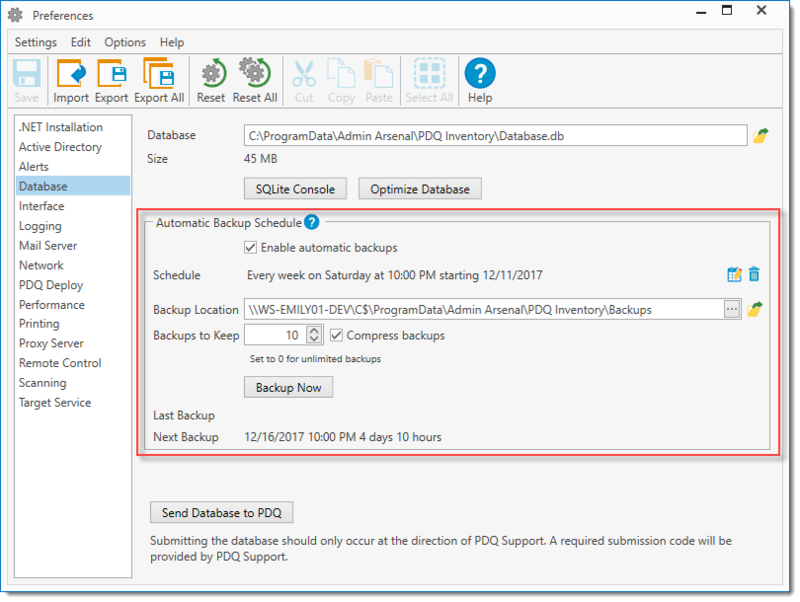 Because the PDQ Inventory database stores all collections, reports, and computer inventory information, it is highly recommended that you regularly backup the PDQ Inventory database. Since the SQLite database is a single file, this is easy to accomplish. You can setup an Automatic Backup Schedule in the Database page of Preferences. The default backup schedule is weekly on Saturdays at 10:00 PM. The default will also retain 10 compressed backups. By default, the PDQ Inventory database is located at %ProgramData%\Admin Arsenal\PDQ Inventory\Database.db. To protect your system data, configure your backup software to regularly back up this file. NOTE: To determine the location of the PDQ Inventory database, click Options > Preferences or press Ctrl+Comma, then select Database. The Database field displays the path and filename for the PDQ Inventory database. The backup location displays the path and filename for the backup database files. 1.Click Options > Preferences or press Ctrl+Comma, then select Database. Enables the PDQ Inventory automatic backups feature. This is enabled by default. Displays the current schedule for the automatic backup. Clicking the Edit Schedule button will open the Select Trigger window to edit the schedule. Additionally, you can click the Delete Schedule button to clear the schedule selection. The default schedule is every week on Saturday at 10:00 PM. Note: If no schedule is selected, a backup will not be performed regardless of whether Enable automatic backups is selected. A warning at the bottom of the Automatic Backup Schedule section will notify you if this is the case. Schedule once in the future. •Trigger On: Select the one-time backup date. •Description: (Optional) Description of the schedule. Backs up (and repeats) at a set time interval. •Every: Select backup interval by day and/or hour. •Starting: Select first schedule date. •Ending: (Optional) Date that the schedule ends. Select to enable the end date. Backs up every day at the same time. •Starting: Date that the schedule starts. Backs up every week at the same time on selected days of the week. •On: Day or days that the backups occur. Backs up every month at the same time on selected days. •Trigger Enabled: Enables the schedule trigger for use (selected by default). TIP: Days of Month: If you select the 29th, 30th, or 31st of the month, the backup won't occur in months without those days. Use Last to always deploy on the last day of the month. Can be mixed with Weeks of the Month. TIP: Weekdays/ends of Month: Different combinations of weeks and days are not available (for example, the 1st Monday and the 2nd Friday.) Selecting the 5th day(s) won't deploy in a month without a fifth week. Use Last to always deploy on the last week of the month. Can be mixed with Days of the Month. Displays the path where backup files are stored. The default location is C:\ProgramData\Admin Arsenal\PDQ Inventory\Backups. Click the Open Folder Location button to view the location of the backup. Specifies the number of most recent backup files to keep. Setting this to 0 will save all backups. The default setting is 10. Automatically compresses each backup to save space. This is enabled by default. Backs up immediately instead of waiting for the next scheduled backup. Displays the date and time of the last database backup as well as how long ago the backup was performed. Displays the data and time of the next backup as well as how long until the next backup is performed. When PDQ Inventory deletes information from the PDQ Inventory database, it leaves empty space in the database file which takes up a few bytes. Over time, this space adds up and may impact database performance. Therefore, it is recommended that, on average, you optimize the PDQ Inventory database once a month. Optimizing the database frees up the empty space and gets rid of fragmentation. NOTE: Optimizing the database stops the background service. Any outstanding scans will be aborted so take care to only optimize the database at appropriate times. NOTE: PDQ Inventory automatically optimizes the database when the application is upgraded. 2.In the Preferences menu, click Database. PDQ Inventory warns that the console and background service will be stopped, which will abort any running scans. PDQ Inventory opens a command line window to run the optimization command. 5.When the optimization completes, press Enter to close the command line window. PDQ Inventory automatically restarts and opens the Preferences window. In the case of something happening to your system and you need to revert to a previous version of a database, you can restore the database through an elevated command prompt. 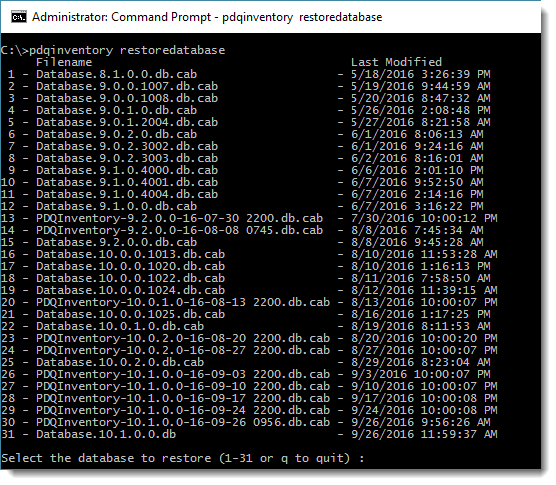 IMPORTANT: This does not restore PDQ Inventory to a different version, this only restores the database. 2.To view the options available when restoring the database, use the following command: PDQInventory.exe RestoreDatabase. 3.Enter the number of the database you wish to restore. 4. (Optional) To automatically restore the most recent database, use the following command: PDQInventory.exe RestoreDatabase -RestoreMostRecent. The database being overwritten will be renamed and left in the same folder.